EASST partners, the Automobile Club of Moldova join new partnership with representatives from across 10 countries, including Austria, Bosnia and Herzegovina, Bulgaria, Croatia, Czech Republic, Hungary, Serbia, Slovakia, and Slovenia, as well as Moldova to improve road safety infrastructure in the Danube region. The new project, titled RADAR, kicked off in June at a meeting of project partners in Budapest. 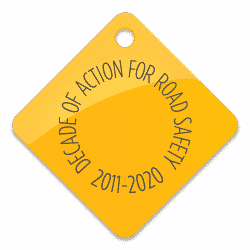 The partnership is led by EASST institutional partners, European Institute for Road Assessment – EuroRAP from Slovenia. The 36-month long project (June 2018 – May 2021) with the financial support of 2,15 million EUR for cooperation on improvement of the road infrastructure safety in the Danube region was approved by the Interreg Danube Transnational Programme 2nd call. The Programme is co-financed by the European Regional Development Fund, the Instrument for Pre-Accession Assistance and European Neighborhood Instrument. RADAR builds on the results of the SENSoR project which was carried out in 2013/14, and in which EASST partners Make Roads Safe Hellas and the Automobile Club of Moldova were leading partners. SENSoR revealed that out of 14 countries in South-East Europe approximately 60-70% of inter-urban roads are categorised high or very high risk. This shows the urgent need to address underperforming road safety performance in the Danube region, where fatality rates are generally higher than the EU average and road infrastructure quality and safety varies hugely from country to country. RADAR will help national governments in the Danube Region to identify the obstacles, reduce the risks, develop a strategy and raise awareness on road infrastructure in the region. The project aims to enhance transnational cooperation in addressing risk on Danube area roads in order to overcome scattered road safety intervention in the region and is set to overcome the lack of professional know-how in tackling the high rates of casualties through practical demonstrations of road safety layout concept solutions. At the meeting in Budapest, partners discussed existing good practices in improving road safety infrastructure in the Danube area and Europe. Nikola Galović, Rotondo, presented how trainings will contribute to raising awareness and capacity building about road infrastructure safety. Extensive and vivid discussion was held about the Danube Road Infrastructure Safety Improvement Strategy and Action plans that was led by Steve Lawson, European Institute for Road Assessment – EuroRAP and Marko Ševrović, University of Zagreb, Faculty of Transport and Traffic Sciences. Mr. Ševrović also presented pilot studies.